Paying international suppliers in US dollars is not the only option and, in many cases, may not be the best option. By offering to pay in the local currency instead US importers can relieve the foreign supplier of the risks and costs of receiving dollars and be able to negotiate a better product price as a result. "When an importer pays a supplier in China, India or Europe, for instance, in US dollars it is highly unlikely that the supplier actually holds a US dollar account. In most cases, the beneficiary of the payment will hold a local currency account (RMB in China, INR in India and EUR in Europe) and the dollars will be converted into the local currency before being deposited to the recipient's account. Sending dollars is relatively easy for a western importer, but receiving dollars poses certain risks or costs to the foreign supplier and they will price these risks and costs into their product. By offering to pay in the local currency instead of dollars, the importer will relieve the supplier of the risks and costs of receiving dollars and should be able to negotiate a better product price as a result. A discount of two to ten percent would be within the realm of expectations given the benefits to the supplier to receive payment in their local currency. 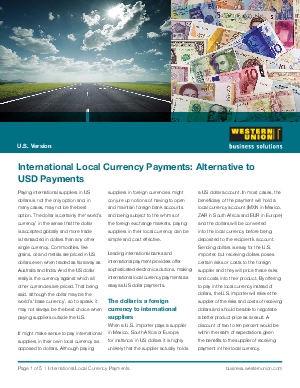 What costs might a foreign supplier face on receiving a dollar payment? When dollars are received by the supplier's bank, they are converted into the local currency at a rate prescribed by the bank, and the beneficiary will have little, if any, influence over this rate. The beneficiary account holder is a captive market for the bank and the bank will likely leverage the fact that they are holding the dollars and the beneficiary has no opportunity to shop the exchange rate. Currency exchange premiums up to ten percent over interbank spot rates are not uncommon in some parts of the world."